Biography - Graham W. Syfert, Esq. 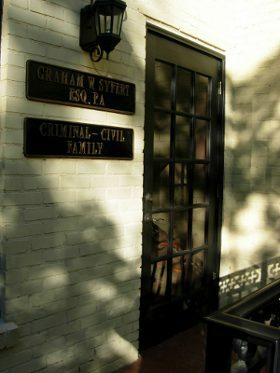 Florida attorney Graham W. Syfert is a member of the Florida and Georgia Bars practicing law in the area of Criminal Defense and felony defense. Mr. Syfert also handles traffic tickets and other white color crimes with a speciality in cases involving scientific evidence, particularly computer crimes. Mr. Syfert graduated from the University of Central Florida with a Bachelors in Philosophy, focusing on Ethics and Religious studies before earning his Juris Doctor from the Florida Coastal School of Law. His excellence in writing and research earned him a position as a staff editor of the Florida Coastal Law Review. Graham teaches has taught defensive strategies to attorneys throughout the state, and was selected to present legal education courses for Law Review CLE and the National Business Institute. He has also taught attorneys for Sterling Education. Mr. Syfert has an attention to detail and thoroughness when it comes to handling the difficult situations of his clients. His background and experience in research and his ability to communicate makes him an attorney you can trust to reach a positive result. Mr. Syfert owned a technology company in Jackson, MS prior to becoming an attorney, and is a member of the Technology Law Section of the Georgia Bar Association, the and the Young Lawyers Division and Solo Practitioners Division of the Florida Bar. Mr. Syfert is also a member of the Jacksonville Bar Association. Graham was born and raised in Illinois and attended Illinois State University before relocating to Florida to be closer to his family. His initial interests in high school and early college were in psychiatry, psychology, and journalism. He was an editor of the school newspaper, and earned the rank of Eagle Scout at the age of 16. Graham is the also the author of forms that include a motion to quash, motion to dismiss, and incorporated affidavit which are designed to provide self help to individuals targeted in the mass bittorrent litigation brought on by the US Copyright Group and the law firm of Dunlap Grubb and Weaver. Mere weeks before Dunlap, Grubb, and Weaver dismissed nearly 5,000 defendants. While the forms have angered the Plaintiff's lawyers, Mr. Syfert's forms have been praised by judges, attorneys, media, and consumer advocates as examples of ways that common people might defend themselves in such a lawsuit. The youngest partner of a Jacksonville law firm focusing on representing businesses, Graham was lead attorney on a Plaintiff's personal injury case which lead to a recovery of nearly a million dollars for one injured party in a multiple injury accident. He formed Graham W. Syfert, Esq., P.A. and now focuses mainly on representing consumers. Graham has represented several religious organizations throughout Florida and Georgia through rendering legal opinions, litigation and negotiation, and navigating media controversy. In 2009, Graham's twelve page motion to dismiss a $1000.00 traffic ticket changed the method of the citation writing among Florida Law Enforcement. In 2010 alone, Graham has secured a dismissal of a DUI, dismissal of a Felony Sale of Cannabis, dismissal of a Carjacking/Kidnapping, and various dismissals of traffic citations. Graham was also the co-founder and title agent for a jacksonville title company founded in 2006, and has represented many realtors and realty companies in civil litigation and before administrative boards on issues of comission disputes and ethics. Graham has represented both buyers and purchasers in real estate transactions, and prepared complicated land trusts for investors, for land management, and for estate purposes.